Club Penguin Cheats by Mimo777 Club Penguin Cheats by Mimo777: RED ALERT! 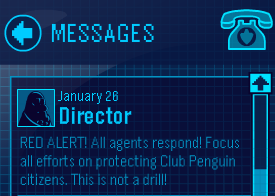 Club Penguin EPF Message! Club Penguin's Director has sent us a Red Alert! This is NOT a drill! Do whatever you can to protect Club Penguin! Hmm, what do you think we should do? Meh..looks like people are going to figure out who's EPF and who's not.eh oh well. Time to put our earpieces on. Mimo when is the aunt arctica tracker comin' out? 2.Click the igloo or the "Upgrade Igloo" catalog. Go to page 2(the page with carpet and dance floor). 3.Click the crowbar at the top of the "Floor Removal" page. You now have the "Stone Igloo" cheat! Herbet will destroy cp! Yay! @4545devin Aunt Arctic tracker would be released when Aunt Arctic is in the public. Like, visiting servers and such. Waddle On!